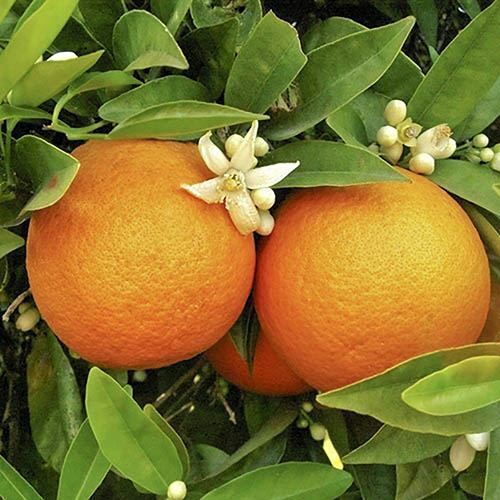 Pick your very own delicious fresh oranges and add a Mediterranean feel to your home or garden! Packed full of vitamin C, these fruits are not only delicious, but good for you as well! Use your fruits in everything from freshly squeezed juices, to yummy desserts, and save tons of money on supermarket prices! Not only that, this superb tree will produce highly fragrant, white blossom during late spring and early summer. Wonderfully sweet, seedless oranges will be ready for you to pick from October each year. To ensure youll be picking delicious fruit year after year, we advise you keep your trees in their pots, and place in a sunny, sheltered position. Protect from frost during the winter time either by bringing indoors into a conservatory, or by covering with a plant cosy. Supplied as 1.2m (4ft) tall, fully mature trees in 6.5 litre pots.